Ready for the family to hit the trails? There are a couple of things you absolutely need to put in your backpack in addition to that safety gear, water and snacks. Hikes with hooks to satiate wandering attention spans and curiosities are ideal for finding the right path. Look for lakes, ponds, waterfalls, huge rocks and wildlife. They’re wondrous diversions of interest. 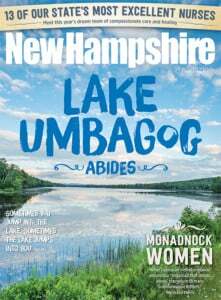 North Conway’s Echo Lake State Park is not only for swimming, but has a gentle loop hike around it. Step up to Pack Monadnock’s tower in Peterborough’s Miller State Park. The third edition of AMC’s “Best Day Hikes in the White Mountains” ($19.95) features color photos and maps for 60 hikes geared to beginner and intermediate hikers. Made for ages six and up, the sturdy L.L. Bean Explorer Backpack has a place for everything from snacks and water bottles to books ($39.95). Made for little hands with varied graphics, Camelbak Eddy Kids Water Bottle ($13) keeps kids happy and hydrated. Spongy bogs are a gateway into the hiking world, often teeming with birds, insects, plants and boardwalks. Rumney’s Quincy Bog Natural Area has a floating bridge and learning center, while the Susan N. McLane Audubon Center in Concord also serves education with hiking on easy, well-marked ways. Stepping up? Mount Major with its eagle-eye vistas above Lake Winnipesaukee is a prime stepping stone. The ledges of Mount Cube in Orford afford fine views of the Connecticut River Valley and points north. Bigger sub-4,000 footers like Mount Monadnock in the state’s southwest corner are a popular goal. Mount Chocorua’s rocky summit spire is a solid prize in the White Mountains. Be sure to bring that patience. Nicky Pizzo is the Appalachian Mountain Club’s Pinkham Notch program manager. She has led numerous family workshops on various topics like Northeast flora and fauna, and alpine ecology. She enjoys hiking with her young daughter. How do you get a family into a routine of using hiking to explore the state for adventure and fitness? Start by planning your hike together. Using maps and guidebooks, choose a hike with an attainable goal for the whole family. Start with an easy, relatively short hike to assess everyone’s ability and interests. What makes a good family hike? A good family hike appeals to children’s sense of adventure and interests. What is everyone interested in? Waterfalls? A pond? Call for rest stops before they are needed. Remember, short legs may take three steps to your one. Plan snack breaks or energy stops. What are those essential kid-friendly items to pack? Parents should have the 10 Essentials plus bug spray and sunblock, wet wipes or tissues, lip balm, small magnifying glass or ‘bug box.’ They should have an extra layer or rain coat, water, snack, a whistle and a garbage bag. Kids’ packs shouldn’t be too heavy, but, especially for older kids, it’s great if they can carry a few items. Dress for success. Dress in synthetic layers if possible, and wear comfortable, appropriate footwear for the hike. Bring a change of clothes and sandals or flip-flops and leave them in the car. It’s nice to change out of wet, sweaty clothes and hiking shoes when you finish your hike. Have a rule or two to share? Talk about expectations and “Leave No Trace” principles at the start of each hike. Discuss the leader and the sweep: who is first and who is last. Everyone else is in the middle. You can take turns being the leader. Talk to kids about what to do if they get lost. At the start of every hike, review the plan. Stop. Stay where you are. Make yourself visible and blow your whistle. If kids carry their own pack, then they have an extra layer to stay warm, a garage bag that can be used as an emergency rain coat and a whistle to blow.